Allie Boy - Allentown PA Easy Read, Easy To Handle "Bought several of these over the years and for the most part they work well except some times they will fail as in my experience. With that said however, it's a good product. Buy it! I check my car(s) tires about every couple weeks." 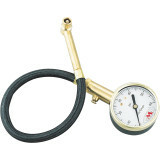 Mtchpnt - Sarasota, FL Accugage- Simple, works "Needed a simple gauge for my car and dirt bike. Works great, hit the reset button and it’s ready to go... would recommend"